In 1995, Adam Gopnik, his wife, and their infant son left the familiar comforts and hassles of New York City for the urbane glamour of the City of Light. Gopnik is a longtime New Yorker writer, and the magazine has sent its writers to Paris for decades--but his was above all a personal pilgrimage to the place that had for so long been the undisputed capital of everything cultural and beautiful. It was also the opportunity to raise a child who would know what it was to romp in the Luxembourg Gardens, to enjoy a croque monsieur in a Left Bank café--a child (and perhaps a father, too) who would have a grasp of that Parisian sense of style we Americans find so elusive. So, in the grand tradition of the American abroad, Gopnik walked the paths of the Tuileries, enjoyed philosophical discussions at his local bistro, wrote as violet twilight fell on the arrondissements. Of course, as readers of Gopnik's beloved and award-winning "Paris Journals" in The New Yorker know, there was also the matter of raising a child and carrying on with day-to-day, not-so-fabled life. Evenings with French intellectuals preceded middle-of-the-night baby feedings; afternoons were filled with trips to the Musée d'Orsay and pinball games; weekday leftovers were eaten while three-star chefs debated a "culinary crisis." As Gopnik describes in this funny and tender book, the dual processes of navigating a foreign city and becoming a parent are not completely dissimilar journeys--both hold new routines, new languages, a new set of rules by which everyday life is lived. With singular wit and insight, Gopnik weaves the magical with the mundane in a wholly delightful, often hilarious look at what it was to be an American family man in Paris at the end of the twentieth century. "We went to Paris for a sentimental reeducation-I did anyway-even though the sentiments we were instructed in were not the ones we were expecting to learn, which I believe is why they call it an education." Adam Gopnik has been writing for The New Yorker since 1986, and his work for the magazine has won the National Magazine Award for Essay and Criticism as well as the George Polk Award for Magazine Reporting. He broadcasts regularly for the Canadian Broadcasting Corporation, and is the author of the article on the culture of the United States in the last two editions of the Encyclopedia Britannica. From 1995 to 2000, Gopnik lived in Paris, where the newspaper Le Monde praised his "witty and Voltairean picture of French life" and the weekly magazine Le Point wrote, "It is impossible to resist delighting in the nuances of his articles, for the details concerning French culture that one discovers even when one is French oneself." He now lives in New York with his wife, Martha Parker, and their two children, Luke and Olivia. "Adam Gopnik's avid intelligence and nimble pen found subjects to love in Paris and in the growth of his small American family there. A conscientious, scrupulously savvy American husband and father meets contemporary France, and fireworks result, lighting up not just the Eiffel Tower." "Adam Gopnik's Paris to the Moon abounds in the sensuous delights of the city--the magical carousel in the Luxembourg Gardens, the tomato dessert at Arpège, even the exquisite awfulness of the new state library. But the even greater joys of this exquisite memoir are timeless and even placeless--the excitement of the journey, the confusion of an outsider, and, most of all, the love of a family." "The chronicle of an American writer's lifelong infatuation with Paris is also an extended meditation--in turn hilarious and deeply moving--on the threat of globalization, the art of parenting, and the civilizing intimacy of family life. Whether he's writing about the singularity of the Papon trial, the glory of bistro cuisine, the wacky idiosyncrasies of French kindergartens, or the vexing bureaucracy of Parisian health clubs, Gopnik's insights are infused with a formidable cultural intelligence, and his prose is as pellucid as that of any essayist. A brilliant, exhilarating book." 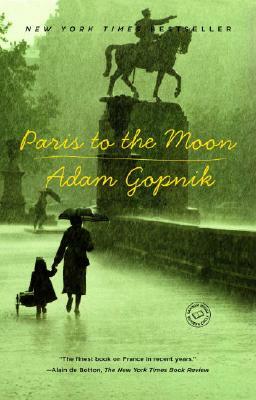 "Adam Gopnik is a dazzling talent--hilarious, winning, and deft--but the surprise of Paris to the Moon is its quiet, moral intelligence. This book begins as journalism and ends up as literature."